Standing/Sitting Desk - I notice none of the pictures show powered standing / Sitting desks, what are your thoughts on incorporating into a home office? Total width of this office please? - Love the clean lines of this space. We would like to know the total width of the space please? What colour is on the walls? Energise with a single itemA classic metal work lamp in a vibrant pink hue ups the style factor in this minimalist office, injecting a tiny touch of zing into the working day. Pick multifunctional pieces Desks can eat up space, so opting for a built-in solution can be a simple way of creating the surface space you need in the most minimal way possible. This desk extends seamlessly from the shelving unit to the wall with no legs required. Discover more ways to make the most of a small office by browsing these photos. Be light and bright Good lighting is key for homework, making office notes and time spent staring at a computer screen – especially once the clocks go back. If you are working in the smallest room in the house, you probably won’t have the biggest window, but you can always beef up the natural light with an adjustable, Anglepoise-style desk lamp and a peppering of spotlights too, built into the ceiling if you’re starting from scratch.An effective mix of focused task lights and all-round general lighting will make sure you get on with the job in hand (just make sure you take regular screen breaks to minimise eye strain and headaches!). Create a micro officeThis small nook on a landing could easily have been overlooked, but the designers of this home got creative with the space instead and slotted in a mini office. By placing a sturdy shelf in front of the window, they created a desk with a view without blocking the light coming into the space. 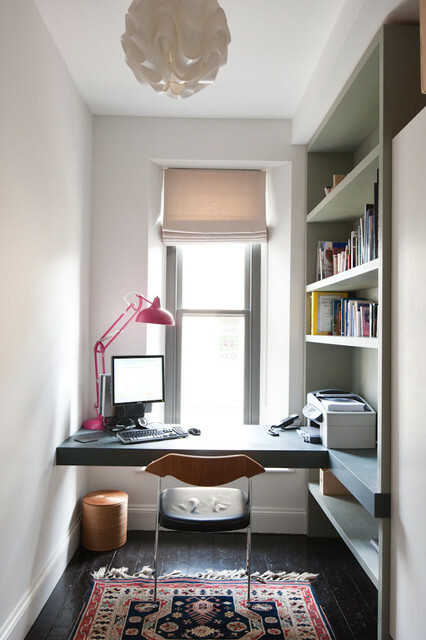 Shelving along the wall is practical for storing books and a printer, while a bright desk lamp adds a shot of colour.